In 1947 France instigated a series of exploratory missions to the Arctic and Antarctica under the leadership of a renowned scientist, Paul-Emile Victor. These expeditions brought together geologists, geodesists, meteorologists, physicists, biologists, geographers and glaciologists all were aiming to explore, study and understand the North and South Poles. The mass of equipment required by the first Paul-Emile Victor missions for exploring these inhospitable regions included four Longines ship’s chronometers and fifteen Longines wristwatches which were used for determining their astronomical position. In honour of these exploratory missions the Swiss watchmaker has re-issued the time-piece used by the scientists on the Expéditions Polaires Françaises – Missions Paul-Emile Victor to explore Greenland and the Adélie Coast. In the second half of the 1940s, public opinion was fascinated by the most distant corners of the Earth, which aroused a passionate interest among many people. Like other countries, France set up a body for organising national scientific expeditions, namely to the Arctic and Antarctica. Paul-Emile Victor, an ethnologist and explorer who had already spent a good deal of time in Greenland during the 1930s, was mandated to create and manage the new office. Between 1947 and 1976 the Expéditions Polaires Françaises – Missions Paul-Emile Victor organised 150 trips to Greenland and the Adélie Coast, led by the ethnologist. A considerable amount of equipment was necessary for these expeditions in order to deal with the difficult conditions that prevailed in the inhospitable areas to which they were going. For example the expedition that left Europe in May 1948, took seven amphibious tracked vehicles, two Dakota aircraft, tractors, laboratory trailers, a mobile weather station, tents, sledges and 30 lorry-loads of supplies. For this exploratory trip the scientists also took four Longines chronometers, three being set to civil time and one to sidereal time. 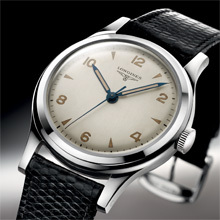 Fifteen members of the expedition wore stainless steel wristwatches made by Longines. These time-measuring instruments were intended primarily for determining the astronomical position of the expedition (they were also used for precise geodesic calculations). The reports on the performance of these timepieces written by the scientists who used them are a reminder of the crucial role such instruments played in scientific expeditions to the remotest parts of the world. By being part of these scientific expeditions in the mid-20th century, Longines also travelled northwards and southwards, to the two Poles. 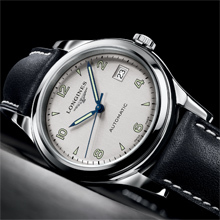 The Longines watch that the members of the Expéditions Polaires Françaises – Missions Paul-Emile Victor wore was a stainless steel wristwatch with a centre seconds. A centrally mounted second hand was still quite rare in the 1940s but apparently met the need for easy reading, as illustrated by the use of luminescent coating on the hour symbols, the numerals and the hands. A point of interest is that the Longines 12.68N calibre used in this model had an anti-shock device that was different from the standard feature in other Longines watches. Longines has decided to re-issue the timepiece that accompanied the scientists who took part in the Expéditions Polaires Françaises – Missions Paul-Emile Victor as a tribute to these expeditions to the Arctic and Antarctica to explore the remotest corners of our planet. The Longines Expéditions Polaires Françaises – Missions Paul-Emile Victor watch is an accurate reproduction of the instrument used at the time by the geologists, geodesists, meteorologists, physicists, biologists, geographers, glaciologists and film-makers that joined the expedition. Fitted with a self-winding mechanical movement, this model has a date aperture at 3 o’clock and a silvered dial with hour symbols and Arabic numerals, as well as hands coated in Super-LumiNova. It is available on a strap in either genuine brown alligator skin or black leather. 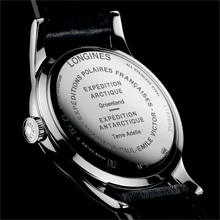 The Longines Expéditions Polaires Françaises – Missions Paul-Emile Victor watch is engraved on the back of the stainless steel case, recalling the two geometrically opposed destinations of these legendary expeditions – the Arctic and Greenland, and the Antarctic and the Adélie Coast.